Competition in business is constantly increasing. More than ever before, providing high quality products and services is the key to survival and growth in today’s marketplace. Whether it is in manufacturing, healthcare or service industries, companies are striving to achieve zero defects. While zero defects sounds great, it seems almost impossible to achieve. The fact is mistakes happen and errors can occur in all types of processes. A machine operator or office worker may get distracted or forget to complete a task or a machine can break a tool and cause an error. Many companies rely on training and work instructions to prevent errors. Historical information indicates that no matter how much training the operator receives or how well the process is documented, human error occurs. While application of standard work practices and operator training are valid methods for reducing the frequency of errors, they will not prevent errors from occurring. Mistake Proofing or Poka-Yoke methodologies can detect errors and prevent the non-conforming part from moving to the next process or leaving your facility. Furthermore, by implementing Error Proofing techniques to detect the error at the source, we can prevent the non-conforming part or product from being produced. Then we are truly on the road towards zero defects. Many practitioners consider the terms Mistake Proofing, Poka-Yoke and Error Proofing one and the same. No matter what title you choose, the fundamental purpose of all three is to prevent errors that cause defects, notify the operator if an error has occurred or prevent the defect from moving to the next step in the process or reaching the customer. While they are the same in many ways, when you investigate the history and deeper meanings of the terms, you discover there are slight differences between them. Mistake Proofing or Poka-Yoke methods are not new to industry. In the 1960s, Mr. Shigeo Shingo first utilized the term Poka-Yoke to describe industrial processes designed to prevent human errors. Shingo made a distinction between the idea of unavoidable human mistakes and defects in manufacturing. Shingo stated, “Defects occur when the mistakes are allowed to reach the customer”. In other words, the mistakes made by operators during production become product defects in the eyes of the customer. The goal of Poka-Yoke is to design the process so that mistakes can be prevented before the fact, or detected and corrected immediately, thereby, eliminating defects at the source. The first widespread use of error proofing occurred as part of the Toyota Production System (TPS). Since then the methodology has spread into many industries worldwide. As previously noted; Mistake Proofing or Poka-Yoke has three levels of application, with Error Proofing being equivalent to the highest level. The most effective way of reducing or eliminating defects due to errors is to prevent them at the source, at the point of creation. Tools which help identify where Error Proofing can be applied are Failure Mode and Effects Analysis (FMEA), Fault Tree Analysis (FTA), and Advanced Product Quality Planning (APQP). Error Proofing philosophy promotes a mindset of zero defects. The only way to have zero defects is to prevent any defects from ever happening. If we examine error proofing closely, we discover that it is actually a form of 100% inspection at the source of the error. Mistake Proofing or Poka-Yoke are more than a set of tools or methods. They are similar to Kaizen in the fact that everyone can and should continually look for ways to improve their processes by implementing Mistake Proofing methods and devices. Mistake Proofing does not have to include new technology or expensive equipment. In fact, some of the best ideas are also usually very low in cost and very effective. It was said that many of Shingo’s poka- yokes cost less than $50. Mistake Proofing is about preventing errors, notifying the operator when an error does occur and stopping the error from moving to the next operation or becoming a defect for our customers. To achieve the highest levels of quality in our products or processes and reduce cost we must reduce errors and prevent defects. Errors and defects incur very high costs in many industries through wasted production time, rework, and increased scrap. Reducing or eliminating errors in a process can be achieved by either adding more detection controls (i.e. additional inspections, special tools, expensive test equipment) or through the implementation of preventive controls. Implementing mistake proofing or error proofing devices are often less costly than most detection controls. In addition, error proofing reduces or eliminates risk in the process by preventing failures at the point of origin, prior to further expensive processing. The age-old saying “An ounce of prevention is worth a pound of cure” is just as true today. The 1, 10, 100 rule states that as work moves through a process, the cost of correcting an error increases by a factor of ten. In other words, for every dollar invested into prevention controls, it would cost 10 times that for detection and 100 times more if the customer detects the error. In addition, the benefit of implementing Mistake Proofing or Poka-Yoke goes beyond reducing cost. Reducing or eliminating errors in the process will have a profound impact on productivity, product quality and employee morale. Improvements in product quality will promote strong brand equity and increased customer loyalty, all of which will have a positive effect on bottom line. 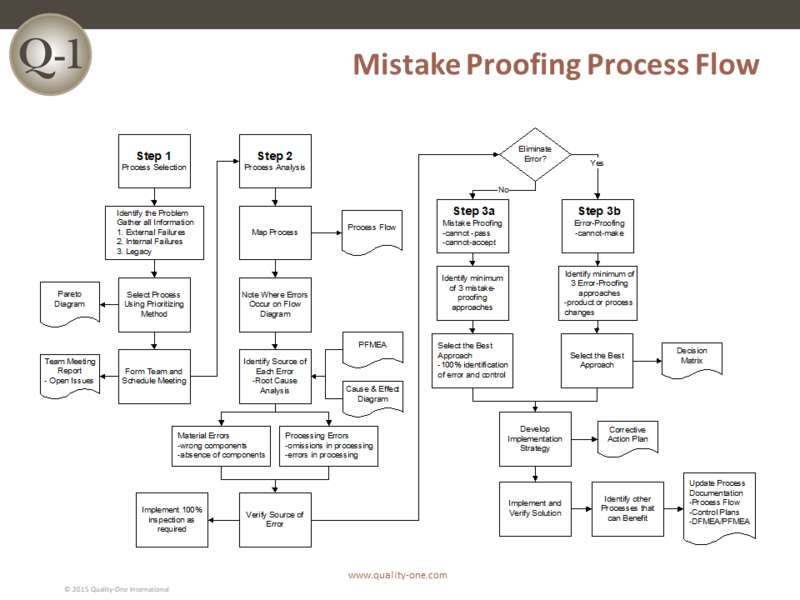 There are several locations where Mistake Proofing devices or methods are routinely placed within a process workflow. The location in the workflow can affect the level of effectiveness. Best – The very best location for a mistake proofing device is before the operator or the machine starts the task. Prevent the error by not allowing the process to start unless a particular set of conditions exist. Better – The second best location is during the process step or cycle. Provide feedback or notification to the operator or machine when an error has occurred and physically prevent the part from moving to the next operation. Some applications provide notification that the operation was performed correctly prior to advancing the part. Good – The final location for a device is downstream at an inspection or test station after the operation or process step is complete. In this scenario, we are completely dependent upon detection controls. The objective is to detect any defects prior to proceeding to the next step in the process. There is more than one aspect to consider when initially implementing Mistake Proofing methodology. First, management must be willing to devote resources and support for the implementation process to be a success. Empower your employees and provide proper training and coaching. Equip them with the tools and skill-set necessary to do the job right. When applying Mistake Proofing or Poka-Yoke methodology the first step is to build a cross functional team to review the process. The team should consist of workers, quality technicians, manufacturing engineers, quality engineers and production supervisors among others. Each member of the team should have received proper training in mistake proofing or error proofing methods and possess a thorough knowledge of the process to be reviewed, including any history of process errors or product defects. Select the process that you will be evaluating. The selection could be based upon total impact on company KPIs, process complexity and frequency of errors, warranty history or recent quality issues. A Pareto can provide valuable information in selecting the process. The point is to select the process with the most potential for improvement. Obtain a copy of the latest process flow diagram and review each step in the process. If a process map or process flow does not exist, create one. Have the team brainstorm to identify all of the possible errors that could occur within the process. Think about where and when human errors are likely to occur. The Process FMEA is one effective tool for identifying risk in a process and prioritizing each of the potential errors. For each potential error, work back through the process to determine the source or point of creation. Look for ways to prevent the error from occurring through examination of the point of origin. If the step cannot be simplified or eliminated then select the appropriate device or method of mistake proofing for the operation. Develop and implement the Mistake Proofing device or method into the process. Always make sure that operators on the line are aware of the changes made and how it will benefit them. Measure the effectiveness of the Poka-Yoke or Mistake Proofing device or method. Monitor for improvements in efficiency, reduction in errors, rework and scrap. Determine whether the change was effective. Use the knowledge gained through the first exercise to make improvements in similar processes. Continue to review the processes and look for ways to prevent errors that could result in defects until it becomes part of the organizational culture. Gradual continuous improvement should become part of the daily routine. Mistake Proofing or Poka-Yoke methodology can be implemented into any step within a manufacturing process where errors occur. Through the implementation of effective Mistake Proofing, Poka-Yoke or Error Proofing methods, you will recognize multiple benefits to process efficiency, product quality and reduced scrap. Quality-One offers Quality and Reliability Support for Product and Process Development through Consulting, Training and Project Support. Quality-One provides Knowledge, Guidance and Direction in Quality and Reliability activities, tailored to your unique wants, needs and desires. Let us help you Discover the Value of Mistake Proofing Consulting, Mistake Proofing Training or Mistake Proofing Project Support.